That little green airplane in my menu bar means something important. It means my Macbook thinks it's sitting at my desk plugged into my Thunderbolt display and on Ethernet. It also means that my NAS remote disks are mounted and ready for action. Whenever I plug in my Thunderbolt display ControlPlane jumps into action and mounts my most commonly used volumes so that they are ready to go. ControlPlane is configured to watch a wide variety of hardware and software changes on your Mac. You tell it what those changes mean and what to do. Here's a basic example. I setup two states for my Mac. One state is when I'm at home connected to my Thunderbolt display at my desk and the other state is when I'm sitting somewhere else in my house. 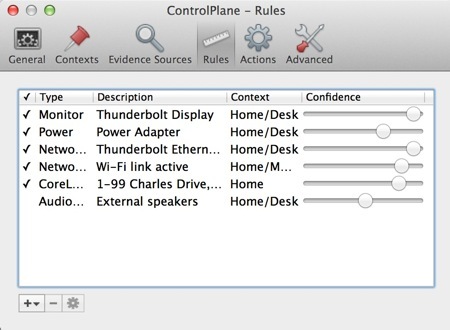 ControlPlane looks at a variety of machine attributes like the active network adapter, connected monitor, and the current power connection. I've provided guidance in the way of confidence levels to determine if I'm at my desk or not. For example, if I'm connected to the Ethernet adapter on my Thunderbolt display, there's a 100% chance I'm sitting at my desk. The checkmarks in the screenshot indicates that a specific condition is met. The next thing to do is to tell ControlPlane what to do with that information. 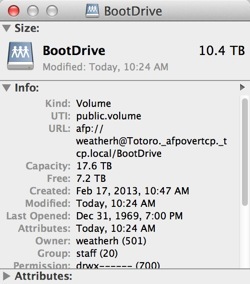 I've told it to mount three different volumes from my NAS. There's a wide variety of other actions available, but these are really what I need every time I'm at my desk. The trickiest part is figuring out how to set the drive parameter in the action. To do this, Path Finder is my friend. You do own Path Finder right? Mount the volume and use "Get Info" in Path Finder. Copy the "URL" parameter in the info window. ControlPlane is pretty terrific. If you work at regular remote locations like an office or coffee shop, you can even have ControlPlane monitor your physical location and set your network and a variety of other options when you arrive and leave. That's pretty cool.